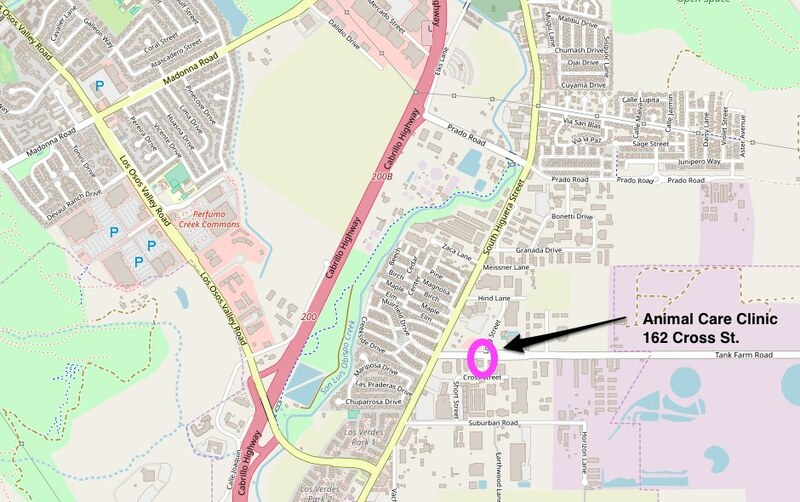 Clinic is just off Tank Farm Rd, 1 block north of lower Higuera St.
• Apiary expansion and splitting preview. February hives are “brooding up” — the rapid expansion of the colony encouraged by the burst of spring flowers. Learn how to manage and benefit from this sudden flush of growth. It’s time to think about a new leadership team: president, vice president, treasurer, secretary. Please consider who you might nominate, including yourself. New team to be named at November meeting. CCBA monthly meeting, Monday, August 20, SLO Guild Hall, 2880 Broad St. San Luis Obispo. It’s not too early to be thinking about a new leadership team: president, vice president, treasurer, secretary… Some team members may wish to continue. Please consider who you might nominate, including yourself. CCBA July meeting, Monday, July 16, 6:30-8:00 p.m. 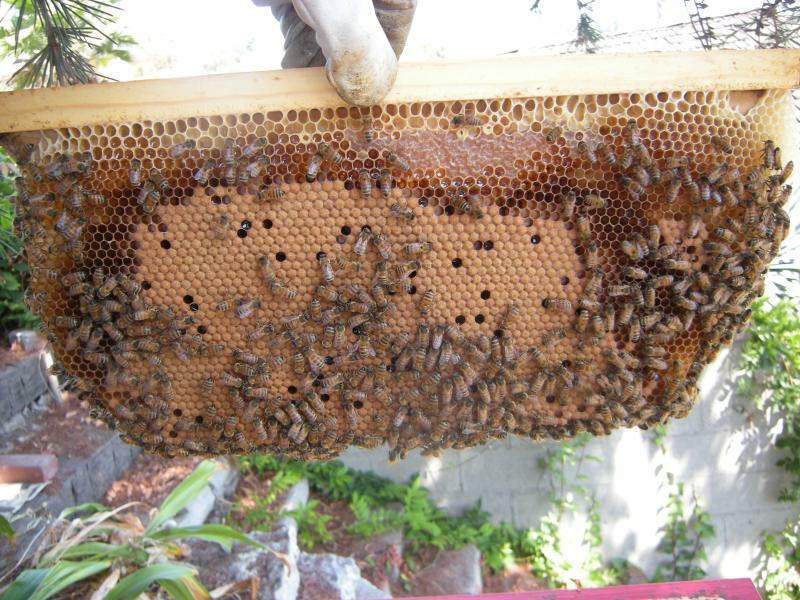 This is an apiary visit, lead by John Hupp, hosted by Robin Gable at SLO Creek Farms, 6455 Monte Rd., San Luis Obispo. Exit Hwy 101, west onto San Luis Bay Dr. Take first left onto Monte Rd. Bring protective gear, water, and a chair. Apiary visit hosted by Lena Thompson, lead by Summer van Buerden. 7450 Vernalis Rd., Atascadero. Last house on the left on dead end road. Please drive very slowly. Please bring protective clothing and a portable chair. Apiary visit hosted by Kathy Longacre, 6440 Corral de Piedra, San Luis Obispo. Bring protective clothing and a chair. From SLO take Hwy. 227, to Price Canyon Road west. Take first right, immediately after railroad tracks, at .3 miles, onto Corral de Piedra. Continue on gravel road to parking at a turn-around. The property is along the railroad tracks with a shed and a big gate into the property. From Pismo take Price Canyon Rd, turn left before the railroad tracks, onto Corral de Piedra. CCBA monthly meeting, Monday, April 16. We are celebrating our 4th anniversary. Bring a potluck dish to share. Saturday, March 24, 1-3 p.m. Oak Creek Commons 635 Nicklaus St. Led by Erin Holden: We’ll discuss the basics of keeping bees; hive design and equipment, procuring bees, bee hierarchy, honey harvest and pest management. Fee: $20 for CCBA club members. Will accept venmo. $15 club dues for 2018 – cash only please. CCBA monthly meeting, Monday, March. 19, SLO Guild Hall, 2880 Broad St. San Luis Obispo. 6:30 – Guest speaker: Gordon Wardell is making a presentation on bee nutrition. 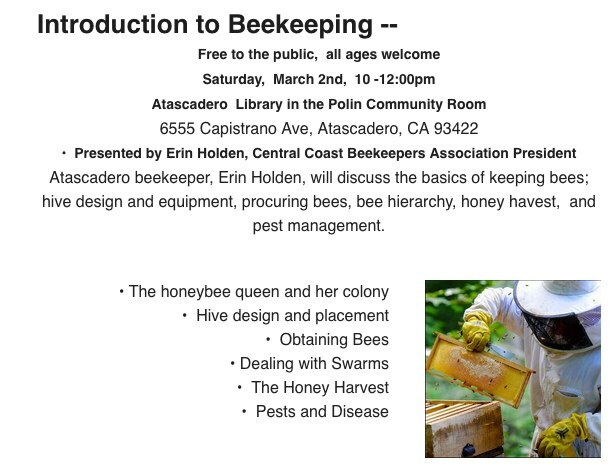 We are offering a beginning beekeeping class on March 24, led by Erin Holden. See attached flyer for details.